Not sure how to cook tofu? This step-by-step tutorial will have you cooking restaurant-worthy tofu that’s deliciously crisp on the outside, while moist and tender on the inside. A few months ago, I received an excited phone call from my mom, informing me that my dad was going to be out for the evening, so she was going to cook up some tofu for herself. (Dad’s not down with tofu.) She didn’t really know how to cook tofu, though, so she wanted some advice. Anyhow, I found myself wishing I had a good tofu tutorial to refer her to. Well, now I do! I should mention this: there are lots of ways to cook tofu. Baked, scrambled, and au naturale, among others. Today I’m talking about pan-frying. This is the cooking method you’ll see most often in my recipes, and it’s my favorite. It’s probably the most versatile method, and works great for tofu that gets eaten in stir-fries, curries, or even right off of the plate. 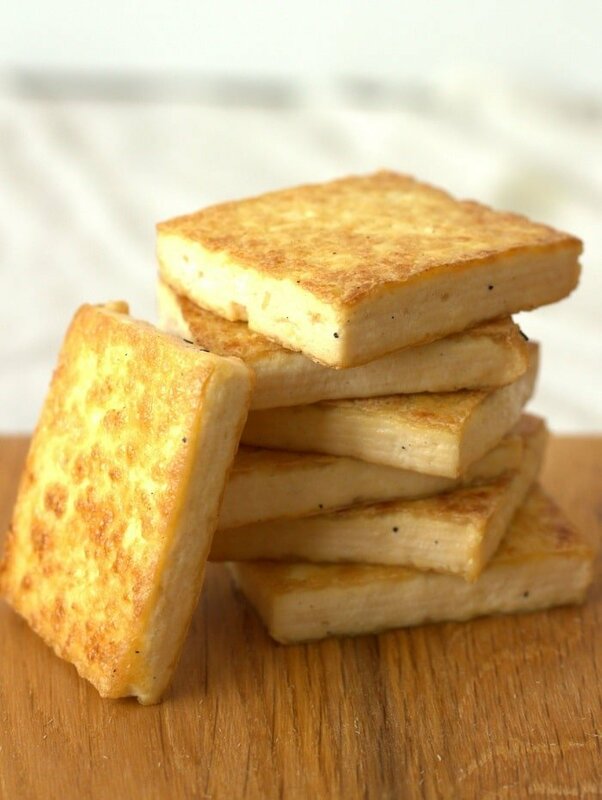 If you’ve ever dined at a vegetarian or Asian restaurant and been served tofu that’s perfectly crispy on the outside, while moist and tender on the inside, it was probably pan-fried. On to the how to! I don’t have a brand preference, though I will say a couple of things. First, Trader Joe’s sells a “Super Firm” tofu, which is great for getting a crispy outer crust, but not so much for inner softness. If you’re working on your crust skills, this is a great product for tofu noobs. 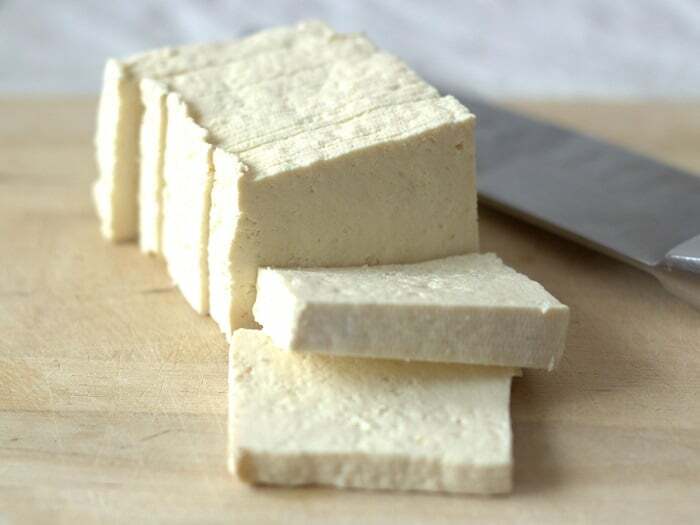 Second, if you’ve got an Asian market nearby, there’s a good chance you can buy fresh made tofu from them, and there’s a good chance it will be delicious as heck. Squeeeeeeeze the water out. This is crucial. Think about this: your goal is crispy, golden browned tofu. Moisture interferes with the browning process. When you steam or boil something in water, it doesn’t get browned or crispy, whereas it might if you baked or fried it. So it’s important to remove as much surface moisture as you can. There are a couple of ways of doing this.
. These are easy and handy and I know lots of folks who swear by them, though I’ve always opted for one of the methods below. If you don’t want to invest in a tofu press, you can achieve the same result using a cutting board and some heavy objects. It’s a great way to put those old law school books to use for once. Remove your tofu from the package and drain. 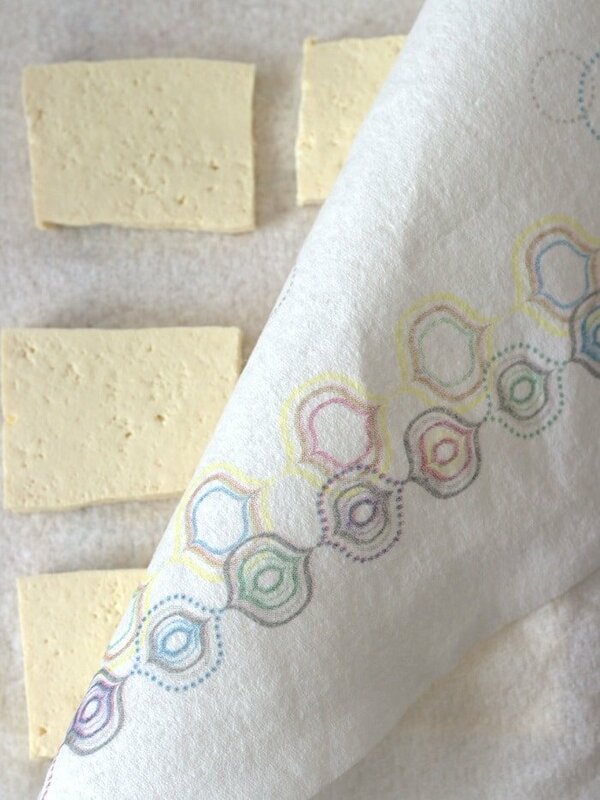 Blot dry and then wrap in a layer of paper towels. Then wrap in a dish towel. 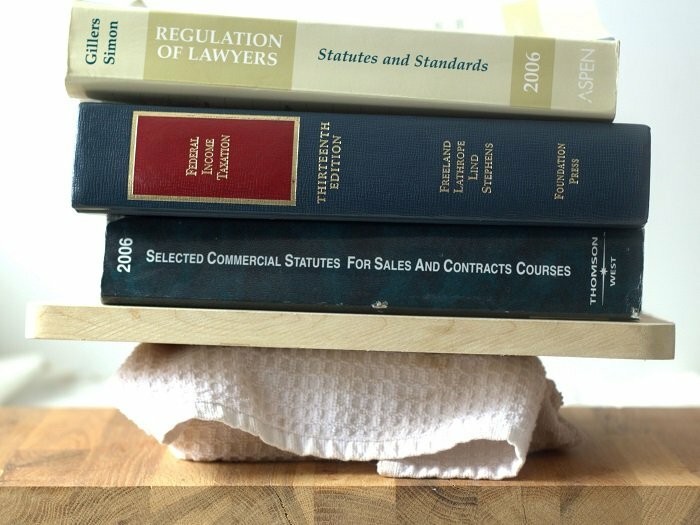 Place a flat object on top, like a cutting board, followed by some weight (enter law school books). Let it sit for 15-30 minutes. Unwrap and you’re ready to go! The downside to this method is the topples. Maybe I went a little overboard with three textbooks, but even with less weight, I tend to keep my ears open for tofu pressing spills in the kitchen while this kind of thing is going on. Another method I’ve been using lately is cutting the tofu first (we’ll talk about cutting in a minute), and placing the pieces between in an even layer between a couple of paper towels with just a little bit of weight, like a single cutting board. Less risk of spillage. Finally, and this one is great for those days when you forget to start your pressing ahead of time, zap it! Cut the tofu into your desired shape and stick in on a plate. Microwave in 1 minute increments. Each time you do this, you’ll find a little puddle of water surrounding the tofu. Blot it up and stick it back in the microwave. I find that about four minutes total microwave time per pound does the trick. I went with half inch thick slabs here, just because that works best for illustrative purposes here, but you can go with bigger slabs, cubes or cute little triangles. Use a good nonstick skillet with a flat bottom. I always go with a well seasoned cast iron skillet, and I swear, it gives me the most perfect, evenly cooked crispy tofu on the planet. Regular old nonstick skillets will work too, but if you’re planning on doing some serious tofu pan-frying, think about investing in cast iron. 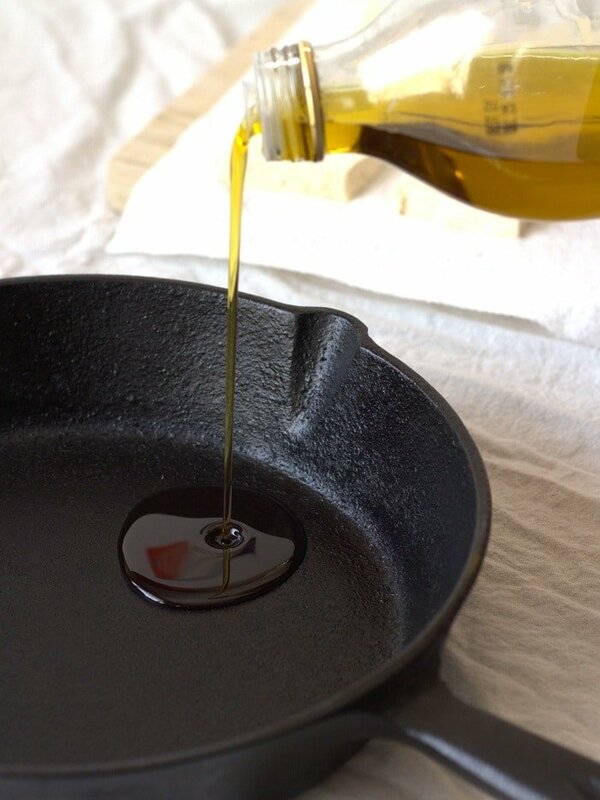 Coat your skillet with a nice, even layer of oil. I’m using extra virgin olive oil here, but you can use your favorite cooking oil, or whatever has a flavor that works best with your final dish. Don’t use too much oil! In fact, I probably went a bit overboard for illustrative purposes in this photo (I ended up blotting). A tablespoon per pound of tofu should be plenty. Stick it on the burner over medium high heat and let it sit there for a minute, until the oil gets a bit shiny. 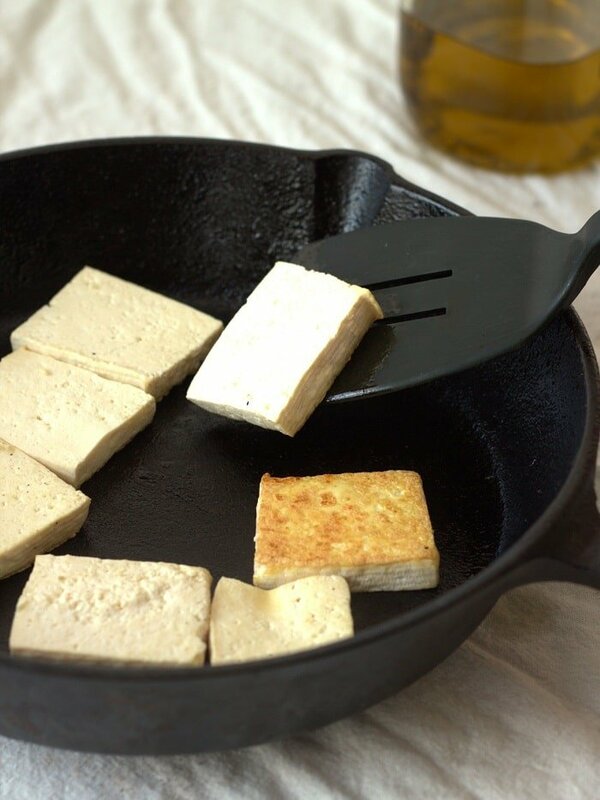 Arrange your tofu pieces in an even layer in the skillet and let them rock. Another reason I like cast iron so much is because it cooks evenly, so you don’t have to do much. If you’re using a skillet with a nonstick surface, you might want to move them around a bit, as you’ll find some cook faster than others. After 4-5 minutes they should be ready to flip. You can probably see some browning going on around the bottom edges, but if not, test flip one. Is it lightly browned and crispy and beautiful? Perfect! Flip ’em all. Mine have a little golden hue from the olive oil. Other oils yield a softer brown. Side note: do this over the burner. My photo wasn’t taken over the burner because it’s so dark in my kitchen. Another beauty of cast iron is that you can move it to another location for snapping shots, and it’ll continue to sizzle. Cook another 4-5 minutes after flipping, until they’re equally crisp on the bottoms. If you went with a shape like cubes, don’t worry about cooking all six sides, unless you’re really compulsive. I always go with two or three sides, and that’s plenty of crisp for me. Now your tofu is done! It should have a fantastic crust on the outside, and be soft and tender on the inside. Season it as you like, or throw it into a stir fry, curry, or your favorite dish that’s in need of some bulk and protein. Like this post? Want to see more? This is a great tutorial! 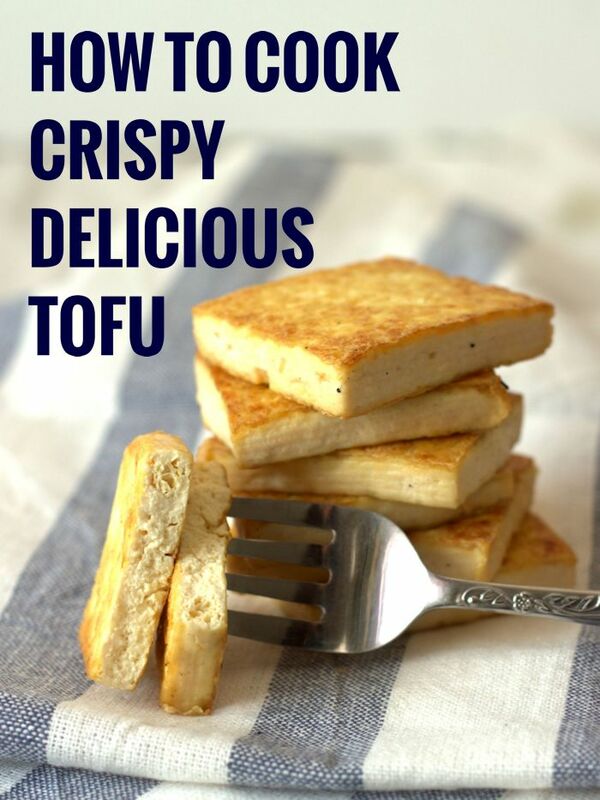 I’ll be sending it out to all the tofu newbies I know, because there’s nothing like some good crispy ‘fu! Thank GOD for this article. 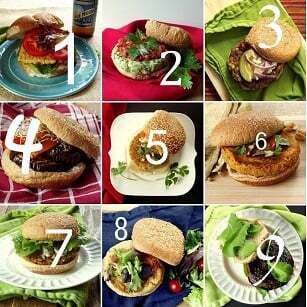 I was beginning to thing i was the worst vegan in the world because I couldn’t cook tofu! This was so helpful. I shared on my page as well. Awesome! So glad to hear it was helpful and thank you so much for sharing! How long would this cooked tofu last in the fridge? Thank you! It should be okay to eat for about a day or two, but it won’t stay crispy in the fridge. Finally, I can cook tofu to where we will eat it! Thank you sooooo much for these directions. I’m so glad you found them helpful! Thanks Carrie!! We’ve been vegan at our house for a couple of years, but only recently bought a tofu press. So Easy! two plates that screw together – no more paper towels, no more planning hours ahead. Put the tofu in the press, crank that baby down, prep ingredients and heat the oil and the “dry” tofu is ready to go! It was inexpensive, easy to clean and store. Is it possible to pan fry it oil free? Thank you!! My 17yo son has been vegan for 2 yrs now & I just about gave up using tofu because it never came out right. Now I can’t wait to use tofu for his vegan lo mein this week! He’s.going to love me! Glad you found this helpful! Enjoy!! Thank you for this article . I’m sure it will help me á lot. I have a question maybe you could help me with. I have only worked with tofu a few times. Until the last time it turned out good.. The last time it was tough and rubbery. Very disappointing. I was wondering did I press it too much? Do you have any ideas what could cause that? Hmmm…sorry to hear that! Was it a different brand? There’s a lot of variation in texture among brands. I’ve even found some variation between blocks from the same brand when I buy them from different stores (I suspect my local supermarket freezes their tofu sometimes, which can change the texture). I really like Trader Joe’s brand and Soyboy, and your best bet is to buy it from a place like Whole Foods that probably sells a lot of tofu, so you know it’s been properly stored. Good luck! Out freaking standing!!! Thank you! Our tofu was perfectly awesome cooked this way in pad Thai tonight! Thank you! I am just beginning my vegan journey. I cooked Tofu for the first time today and it was perfect. I’ve eaten it many times but have always been afraid to try to cook it. I used your tips and it was really good. Thank you for creating this step by step guide. Awesome!! I’m so glad this was helpful for you! Alissa, can you profile this tutorial so I can print it off? Otherwise if I try to print as is I end up with 23 pages! YIKES! This one is on my list to update, so I’ll make a note to do that! Thank you for asking! You can add seasoning at the end! If you’re making a stir-fry, the seasoning comes in via the sauce. Otherwise, you could sprinkle the tofu with lemon juice, salt, pepper, dried spices – whatever you want!